My winter project of fixing excess oil consumption is getting frustrating. Part of the exercise was to install new valve guide seals, even though the current ones were done on the valve job conducted 10,000 miles ago. I looked at the condition of valves, (they were all replaced at the same time as well) and there was enough minor pitting on the exhausts to warrant concern. 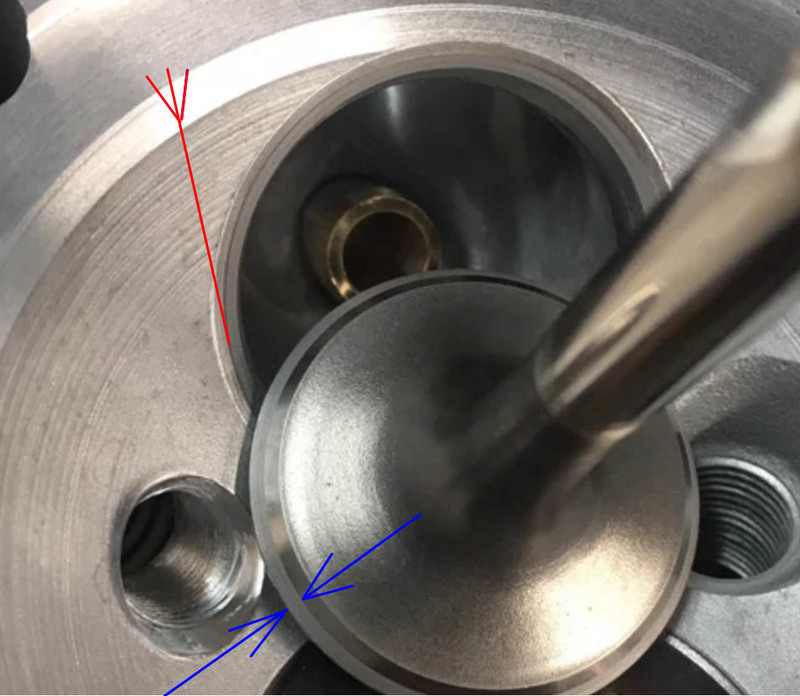 Then I checked the contact area on the valve face and although the margin was 1.5 mm (correct), both the intake and exhaust had the contact area right to the margin rather than in the middle. So I had the exhaust valves touched up (margin ground a tad) and bought Neway cutters to clean up the seats and get the contact area moved higher on the valve. The cut on the 45 and 60 was very minimal to get them cleaned up but I had to remove a ton on the 30 to get the contact area just moved back from the margin a hair. I never could get it to the middle-period. As mentioned, the valves were new Intervalve brand and the head diameter is on the lower limit but in spec for both intake and exhaust. A local engine building shop that does heads for a Porshce indie said they never can get the margin where it should be, always biased toward the head. So, in my mind, either the Intervalve valvehead diameters are a tad small or the barely ground seat is too large a diameter. Nothing else comes to mind that could cause this condition. 1. Anyone else experience this issue with seat contact area being too close to valve head and not being able to get it right? Last edited by brighton911; 03-22-2019 at 03:47 AM.. I was told by my machine shop to use TRW but check threads here. Some say TRW quality is not what it used to be and has had quality control issues, too. I suppose either way, you’ll need to inspect the valves from the supplier before installing to be on the safe side. To give "expert opinion" is above my pay grade. Not sure what you are saying here? If the contact on the valve margin was on the lower side, this would then make the valve high on the seat. Opening up the 45° would lower the contact. You effectively increase the minor and major diameters of the 45° face. This will then lower the valve and move the contact up on the valve margin. I haven't use Neway's for years, maybe over 30 years. The cutters can be adjusted outwards that will allow you to cut the 45° wider. 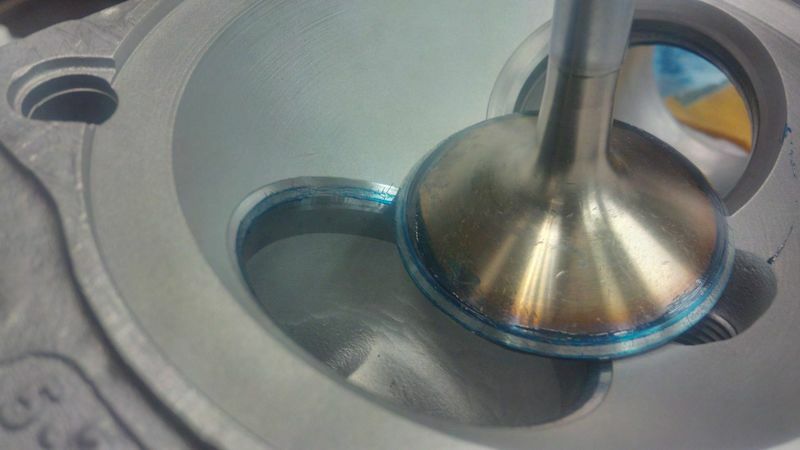 Cut the 45° first and either lap the valve or "blue" it to see where the contact is on the 45°. Continue this to get the contact on the valve margin where you want it. Then use the 30 and 60 to narrow the 45 to the width you want. Remember, you are lowering the valve on the seat when doing this. Look at the chamber and top angle intersection as well as the backside as this will change the retainer height. From my brief experience. My SC heads had (have) narrow seat inserts, with very little meat on the inside. Almost impossible to move the seat inward on the valve face. Had to be very careful to remove only a bare minimum from the seat's 45 angle. I used TRW exhaust valves. OEM. Even had the "P" engraved on them. Seemed to be fine. Interesting that the new exhaust valves have a slightly tapered stem. FWIW, a high performance valve job will have the contact area (45) on the far edge of the valve. This makes the effective valve diameter as big as possible. All you want to see there is just a few thou on the outside of the valve that does not make contact on the seat. This should not affect longevity much. I am running an air cooled 124" V-twin with 12.5-1 compression, Ti valves, .760" lift cam and correspondingly high valve spring pressure, on a .040" margin on the very edge of the valves on Silicon Bronze seats for close to 10,000 miles with no wear or ill effect so far. of the valve, or just slightly off-center toward the margin. of the way down the valve face from the margin." From what I have learned, the Neway instructions are not valid for Porsche aircooled heads. In their case, the contact area will always be right to the margin, it's just the way they were designed. Now it all makes sense. I have advised Neway their instructions (both written and verbal) are not valid for that application. Time to revise them. Last edited by brighton911; 03-22-2019 at 11:56 AM..
IMO, I would not use the Neway, unless the seats are pitted or burned. That is assuming you are NOT changing the guides. I would use old fashion valve grinding paste. If that cleans up the seats you are good to go. I used a Neway set on my heads recently. I would recommend PRACTICING on a junk head before going to work on your heads. Those Neway cutters can be frustrating to achieve a very smooth seat. AND you DON"T want to remove any material from the seats that you don't have to. Last edited by Trackrash; 03-22-2019 at 04:04 PM.. Check your "45° cutter. It may be 46°. I have not used this type of cutter for years, but they do require a feel. If you are doing this for the first time, its like many things, you have to get a feel for what you are doing. It is correct, that the higher on then seat the better the airflow across the seat is. Until it hits the step of the chamber. I have seen many heads after having the seats recut and the seat work is great, but the transition from the top angle to the chamber is very poor. Yes, you get a good seal, but the airflow across the seat is extremely poor. The narrower the seat contact the better also. Intakes typically have 1.00mm or less and the exhausts can have between 1.0mm and more. The narrower the seat contact the more contact force is required by the valve spring with valve diameter also considered. FWIW, these 2V Porsche heads are some of the hardest heads to recon with new valves etc. Hemi chambers with small diameters make the seats harder to get a good transition to the chamber after re cutting the seats. First timers may find it difficult. Hang in there, it can be done, but it is more involved than many think. I was at Daytona back in the 90s for AMA 600cc Supersport. Everyone was amazed that the Honda factory bikes trapped at 164mph while most everyone else was about 10mph down. Tear down revealed valves sitting high in the head toward piston but within legal spec. Guessing more compression and better flow were the reason? 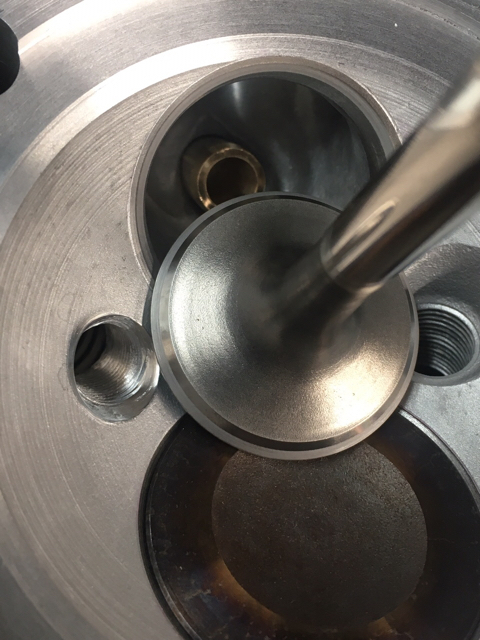 Just checking, Craig, the lighter ring on the valve face is the sealing surface, right? Going to be getting at my heads tomorrow so this is very timely for me. And it seems to confirm for the OP not to worry? The thing I find worrying is there appears to be no contact by the valve face on the outer edge of the 45 of the seat. How wide is the face on that valve? It looks like you could actually narrow down the face on the valve and still be in spec. I will be interested in what the pros have to say. What I'm referring to is the circle at the end of the red arrow. It appears that the valve face is not fully contacting the 45 on the seat. Maybe it is just the way the pic is showing. How wide is your contact area between the blue arrows? On a street head that means nothing, on a Pro Stock head that would be a little worrisome. You would never be able to quantify this on a dyno with a 911. Craig's picture is exactly what I ended up with, and as I have learned, it's not a bad thing. And contrary to the Neway instructions, cutting the 30 would not move the contact area towards the stem. It's an outcome of the head and valve design/dimensions. Again, many thanks to all who offered their experienced advice, without this forum, well I hate to think about it. Mine are also quite close to the valve OD. Using Neways as well, with brand new intervalve valves. Happy with the outcome.